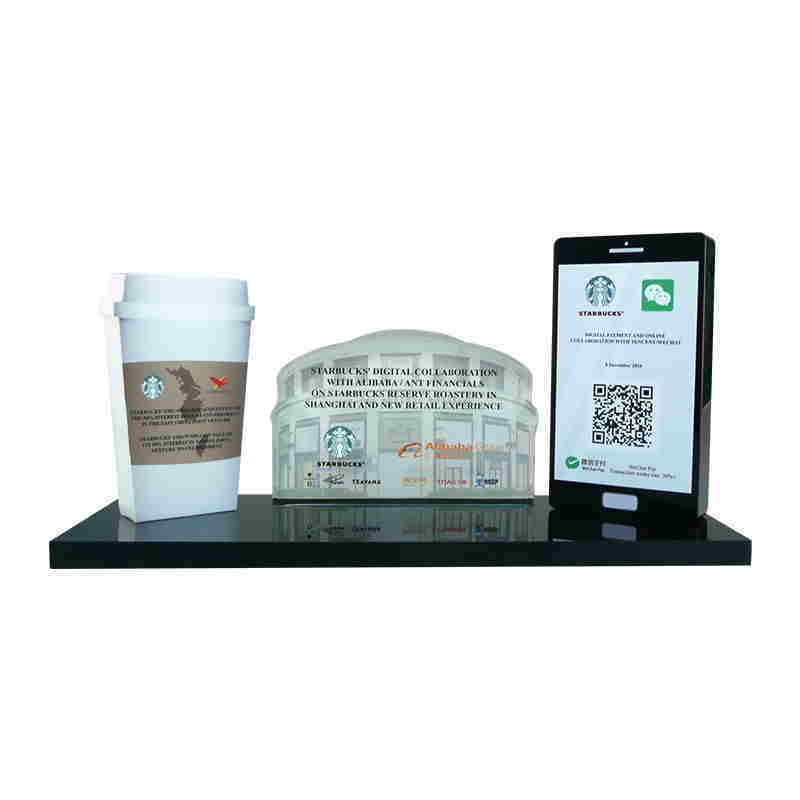 Custom Lucite celebrating a partnership between Alibaba and Starbucks in China. 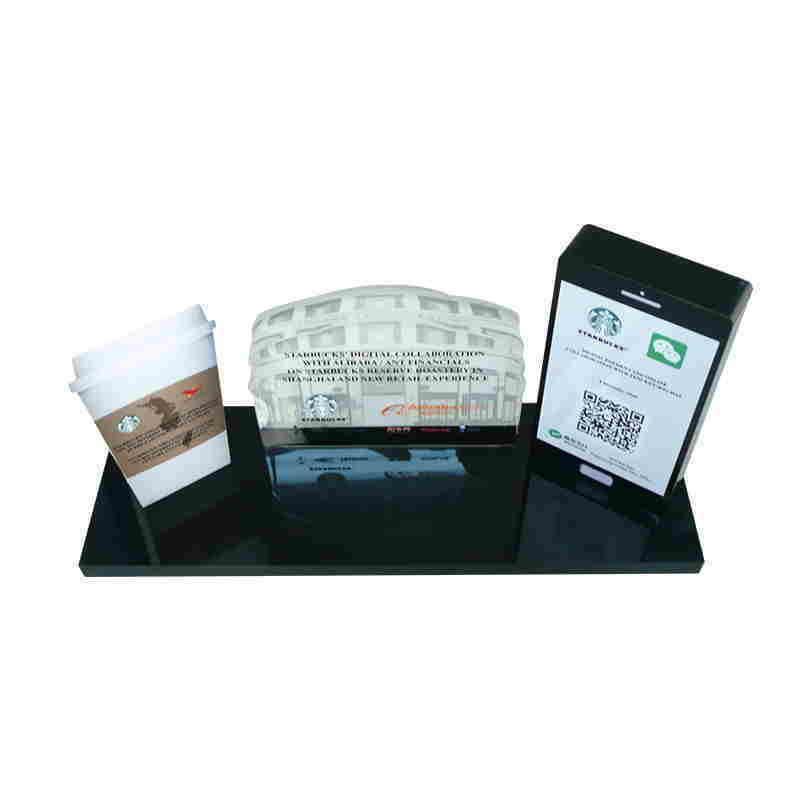 Custom Lucite commemorating a strategic partnership between Alibaba and Starbucks in China. 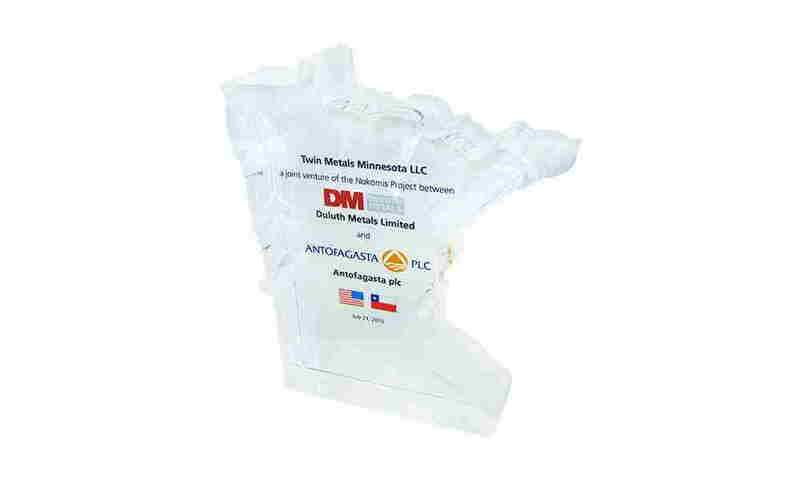 Custom crystal celebrating license and commercialization agreement between Vitrolife and Illumina. 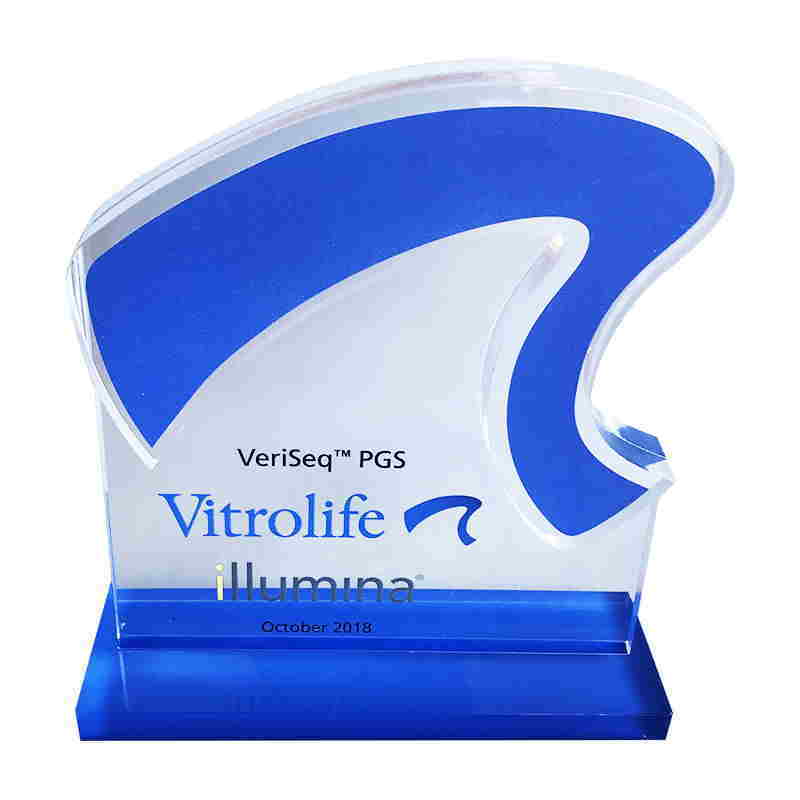 Under the terms of the agreement, Vitrolife gains exclusive distribution, development, and commercialization rights to to Illumina's genetic testing business. 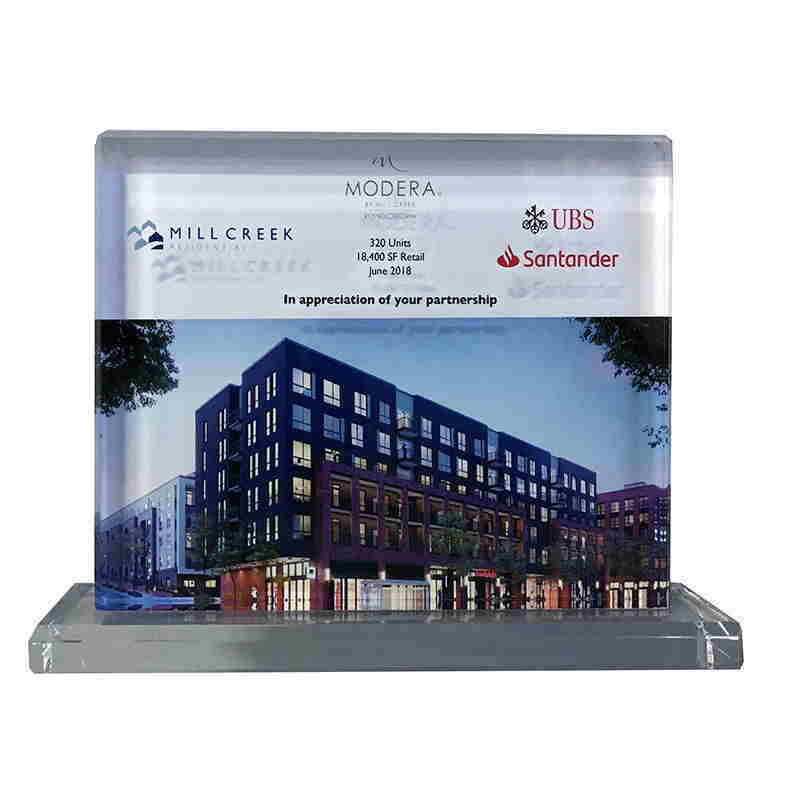 Custom crystal commemorating a real estate partnership centered on an Atlanta mixed-use residential real estate project. The Modera will be a five-story, 320-unit complex. 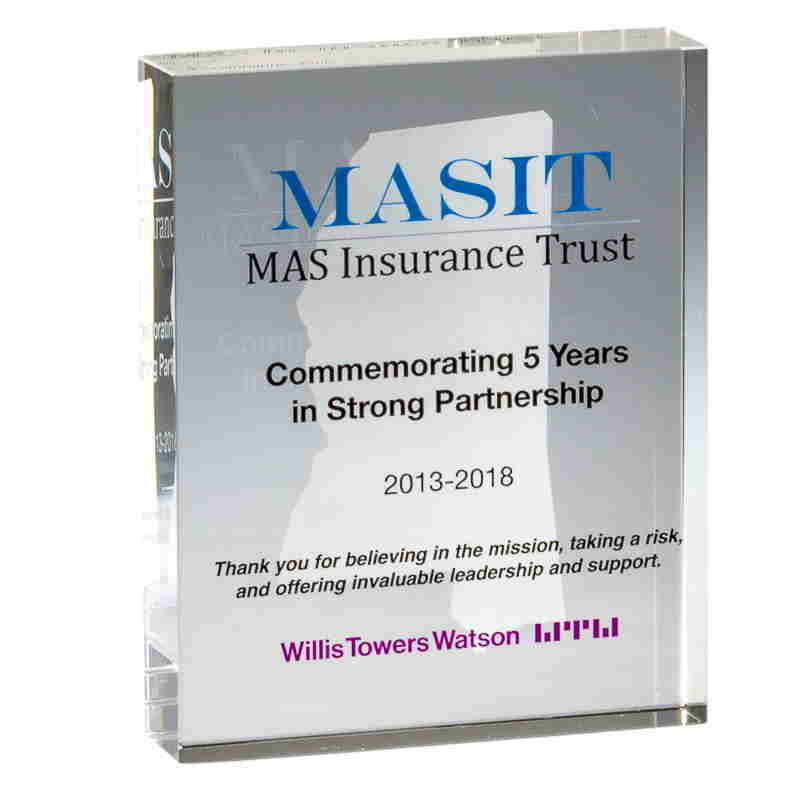 Crystal award recognizing the relationship between the Mississippi Association of Supervisors Insurance Trust (MASIT), and the global advisory firm of Willis Towers Watson. 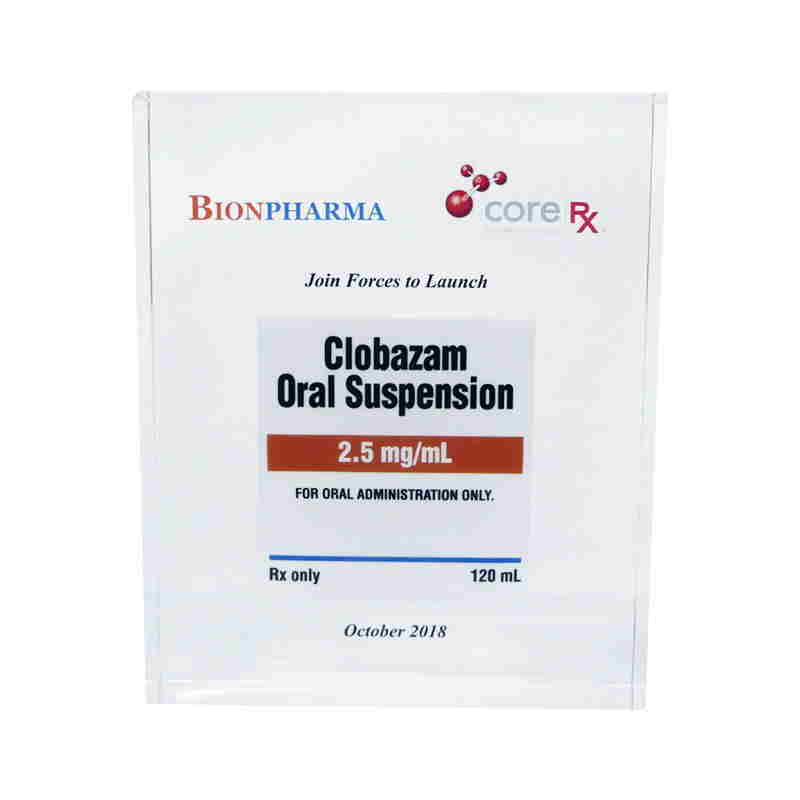 Custom Lucite commemorating the launch of a generic version of Clobazam tablets and oral suspension, for the treatment of seizures associated with Lennox-Gastaut syndrome. 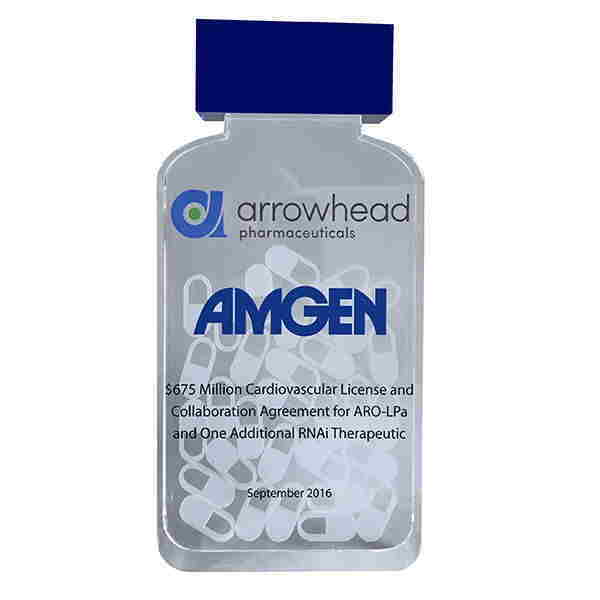 FDA approval was received for these two versions in October, 2018. 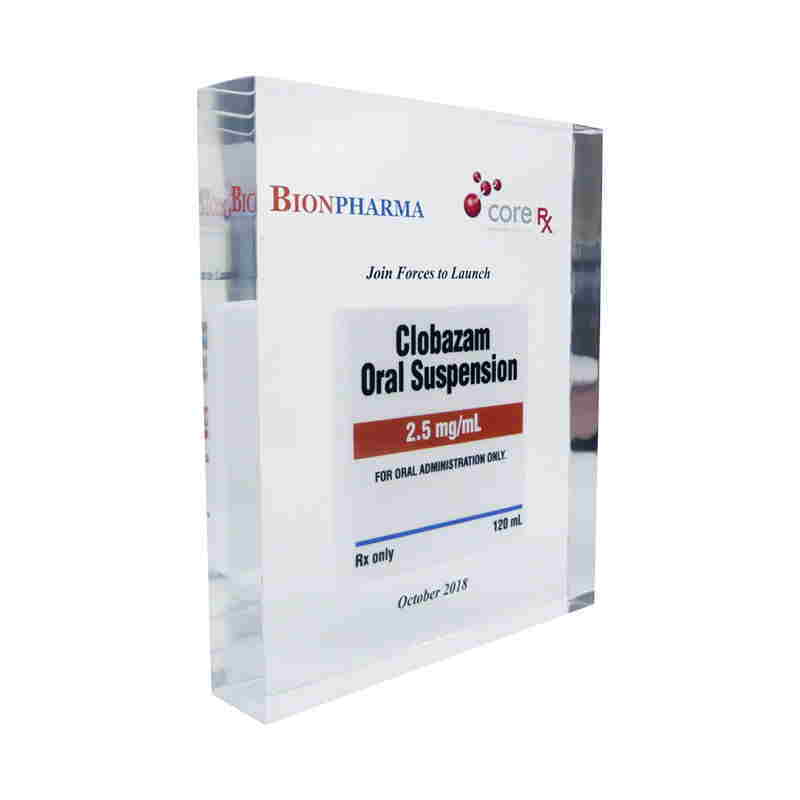 Custom Lucite celebrating a joint venture between New Jersey-based biopharmaceutical firm Bionpharma, and CoreRX, a drug manufacturer based in Tampa Florida. 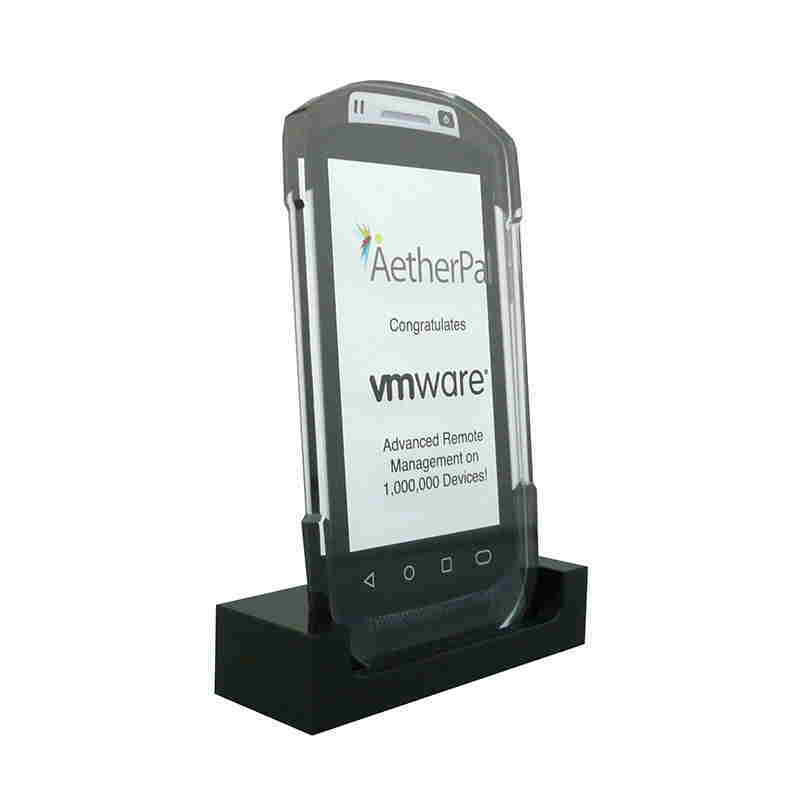 Phone-themed client appreciation gift commemorating the partnership between AetherPal Technology and VMware. 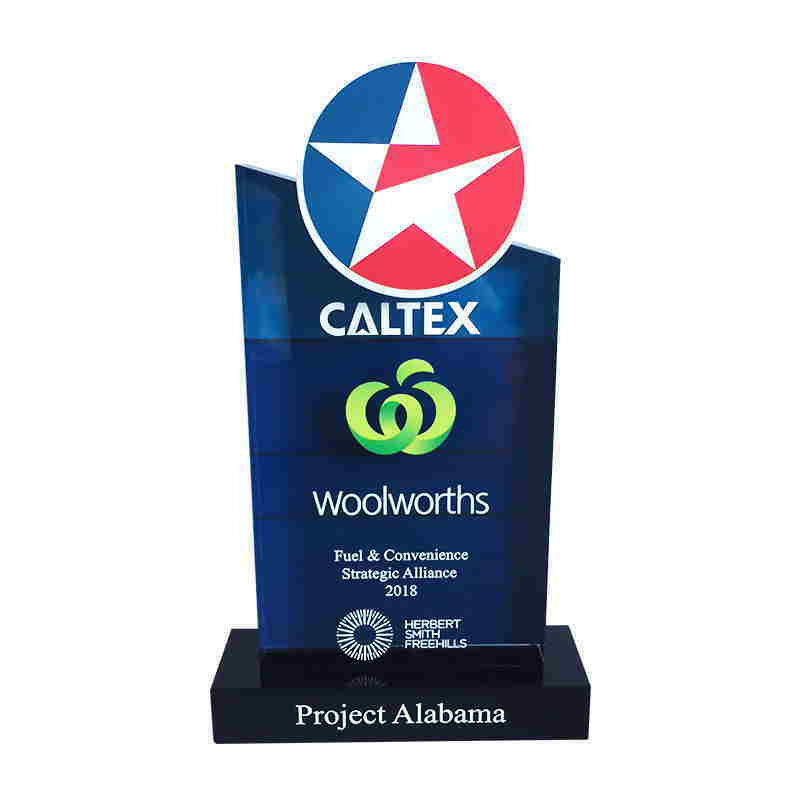 Custom crystal commemorating a strategic alliance between Caltex Australia and Woolworths. 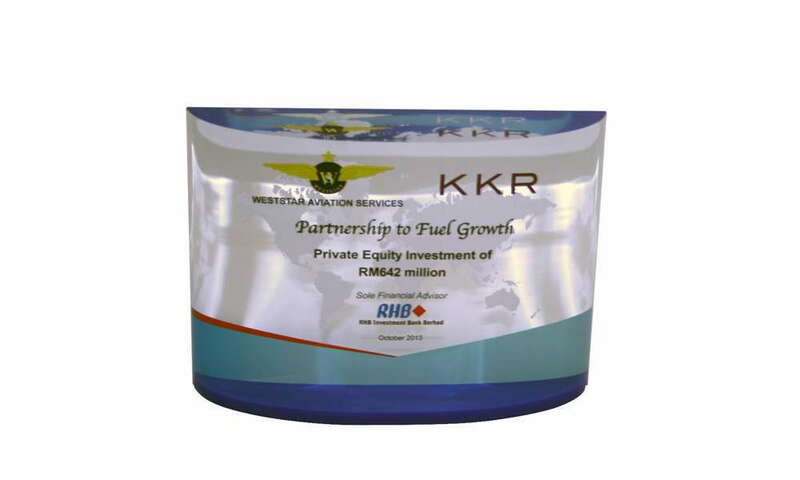 The 15-year agreement focuses on a wholesale fuel supply deal. 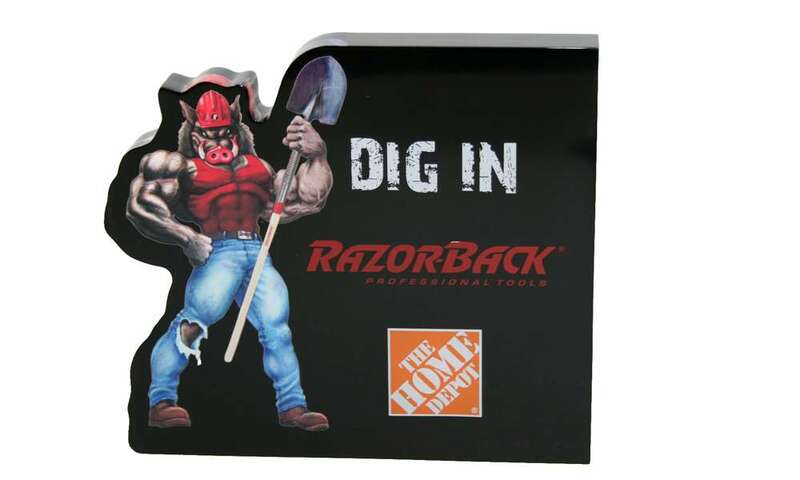 Home Depot and Razor-Back commemorative. 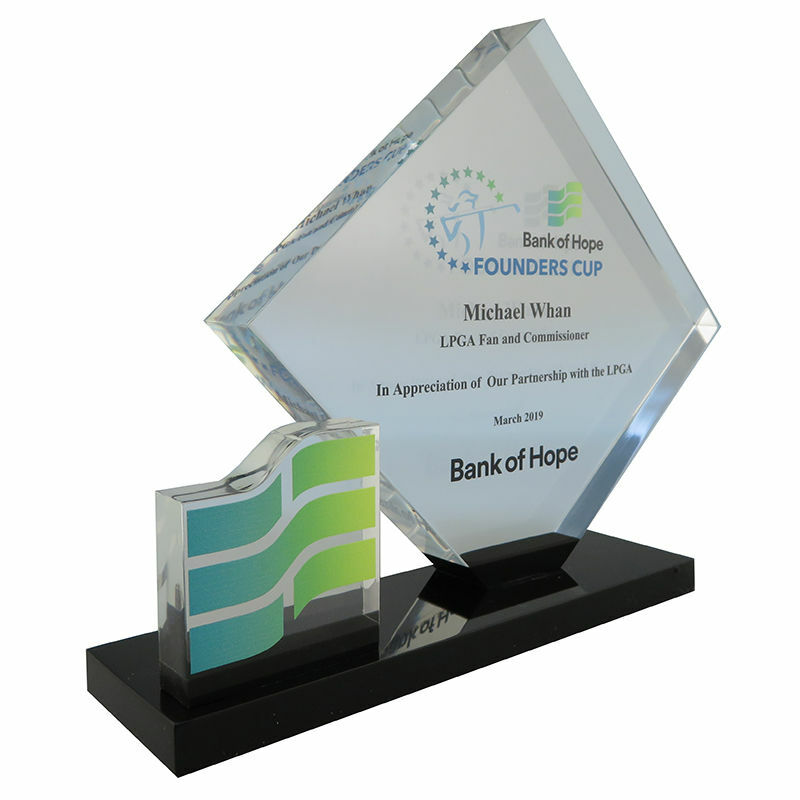 Custom acrylic award commemorating the partnership between Bayer, the global pharmaceutical and life sciences company, and healthcare investment firm Versant Ventures. 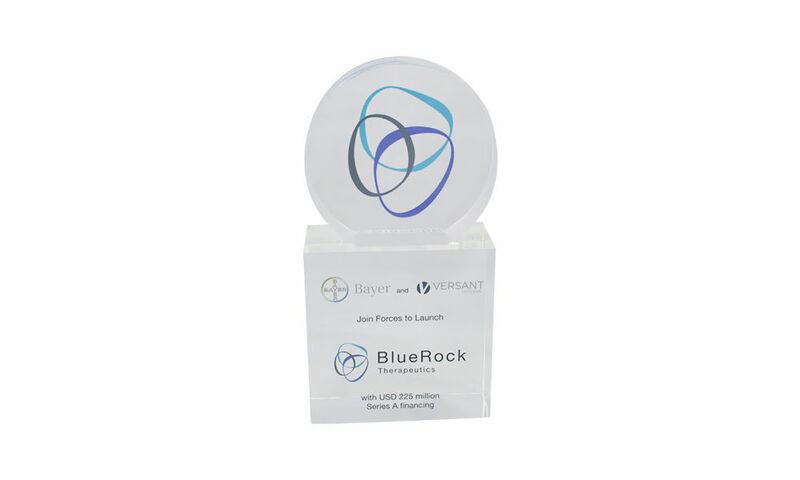 The joint venture, BlueRock Therapeutics will focus its research efforts on medical advances based on stem cell technology. 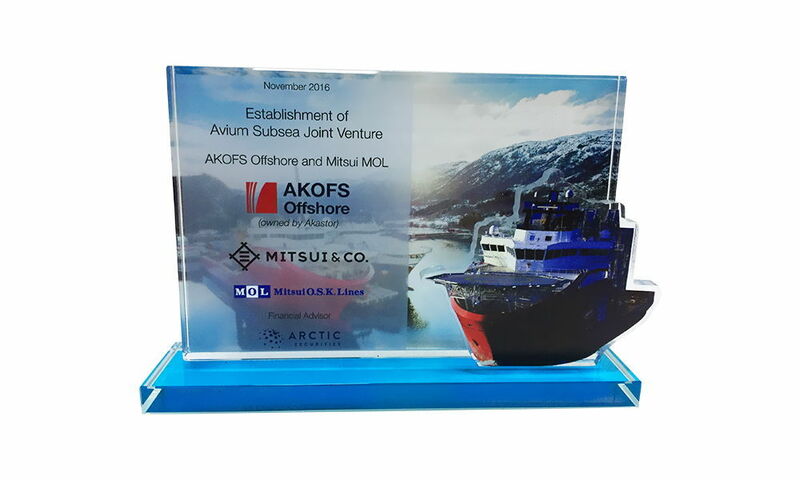 Ship-themed custom crystal award marking a Avium Subsea Joint Venture. 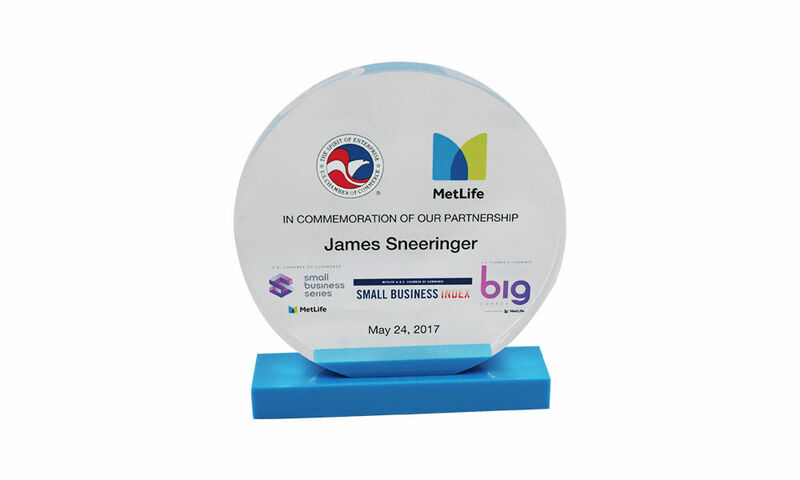 Custom Acrylic Award honoring a joint venture initiative involving the U.S Chamber of Commerce and MetLife. 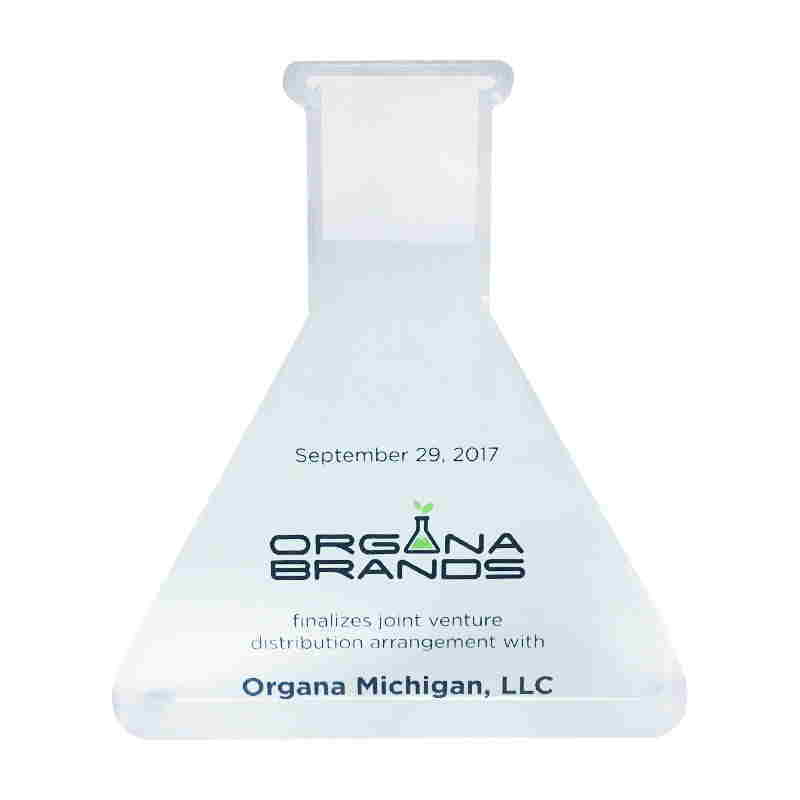 The partnership focuses on supporting small business owners. 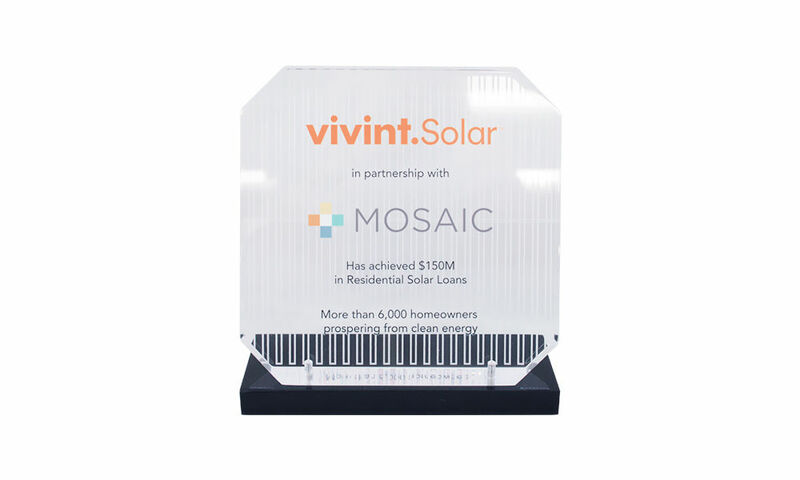 Solar-themed custom crystal award celebrating the combined work of Vivint Solar and financing partner Mosaic in providing $150,000,000 in residential solar loans. 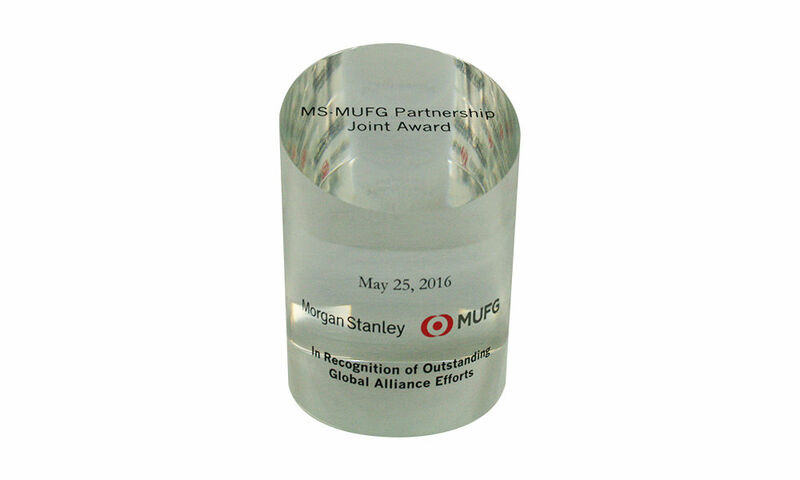 Custom acrylic award recognizing the partnership between Morgan Stanley and Mitsubishi UFJ Financial Group (MUFG). 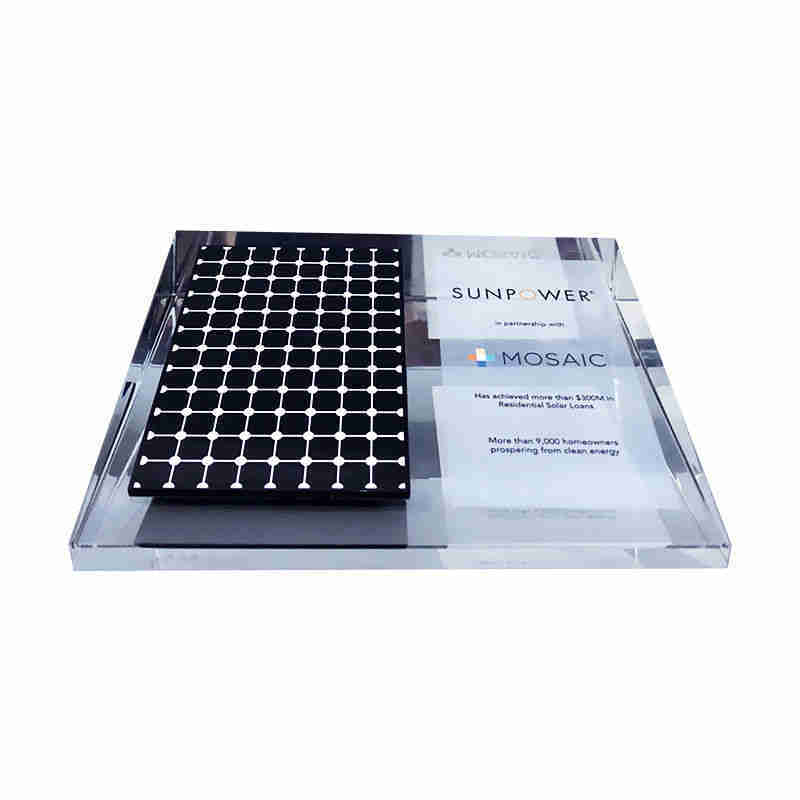 Custom Lucite Award recognizing members of an IT integration team. 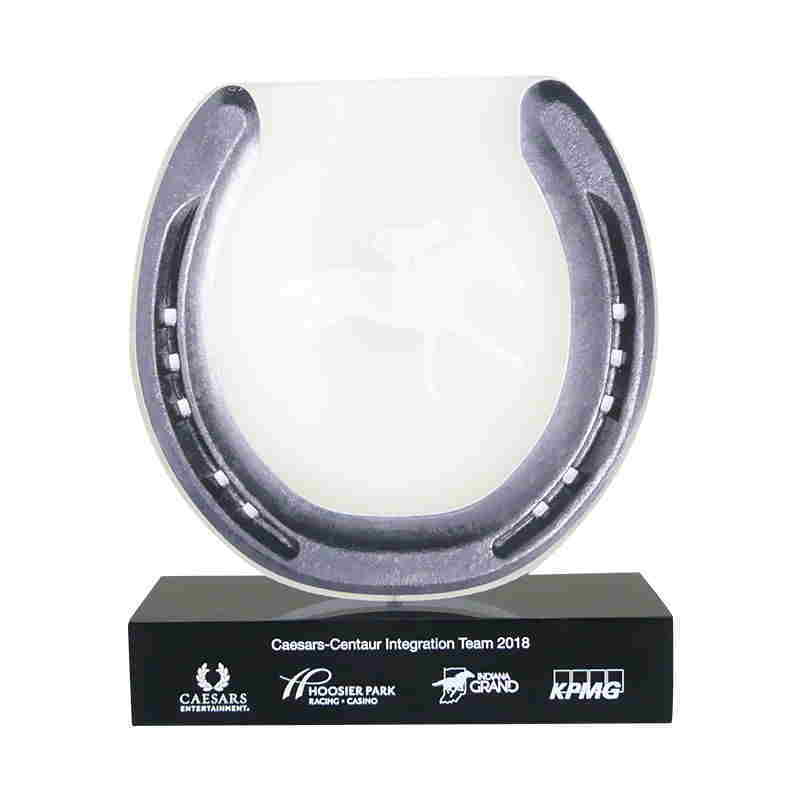 Horseshoe-themed Lucite award recognizing participants in an IT integration in the gambling industry. 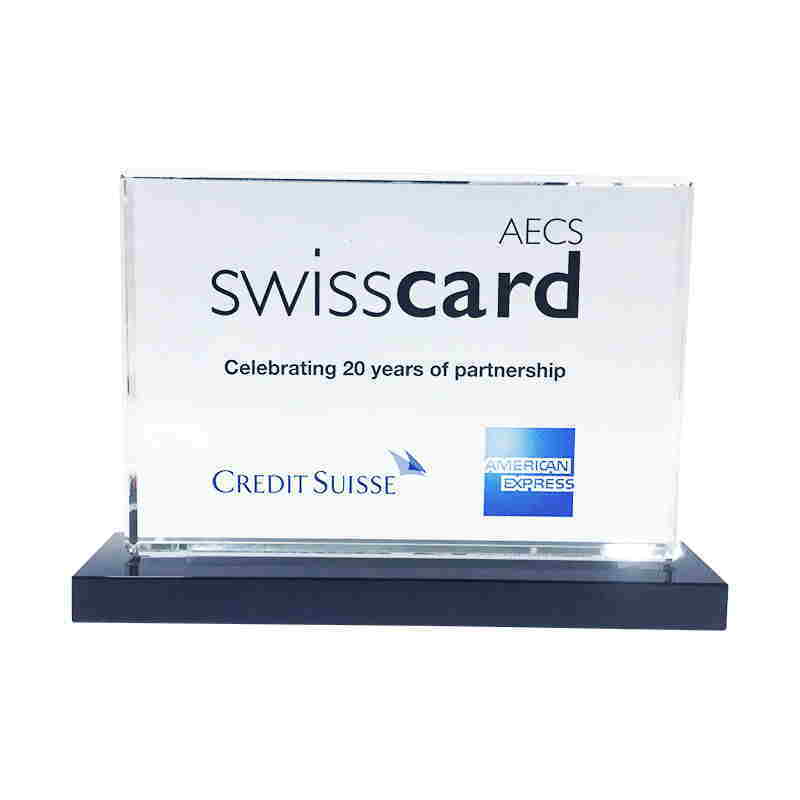 Crystal commemorative marking the 20-year partnership/joint venture between American Express and Credit Suisse. 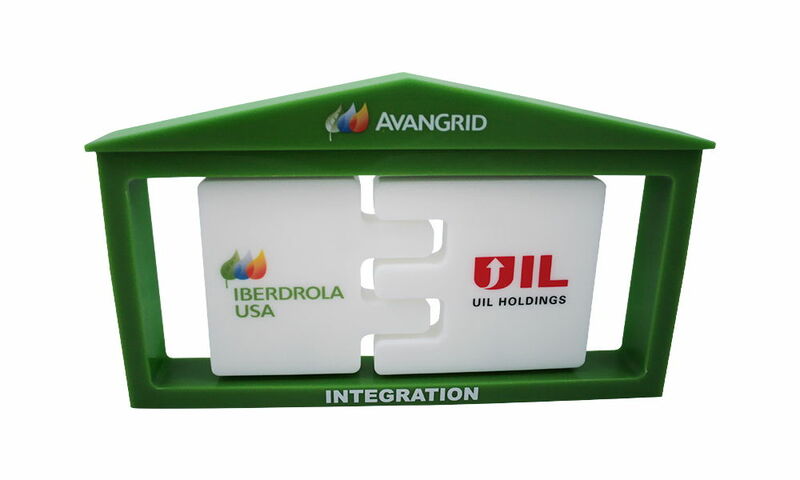 Puzzle-themed custom acrylic award marking the merger of Iberdola USA and UIL Holdings to form Avangrid. 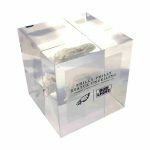 Custom crystal award celebrating the formation of Stadium, a multi-platform sports network. 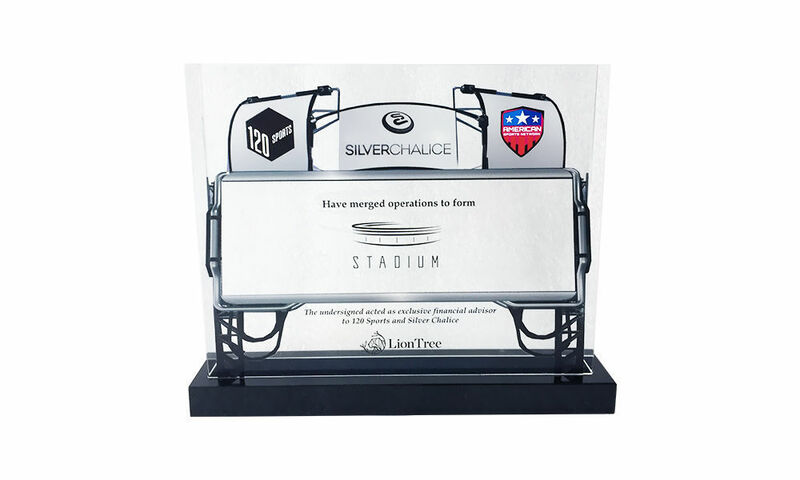 Stadium is a collaboration involving Silver Chalice, Sinclair Broadcast Group (American Sports Network), and 120 Sports. 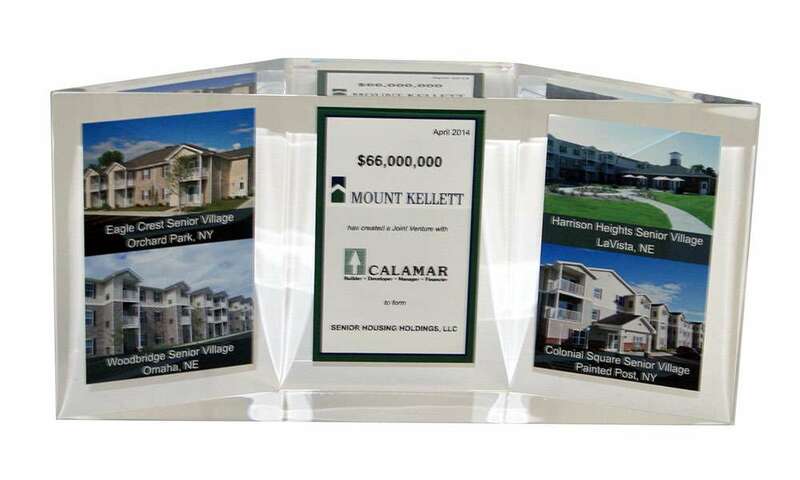 Custom Lucite commemorating a real estate joint venture involving Calamar and Mount Kellett Capital Management. 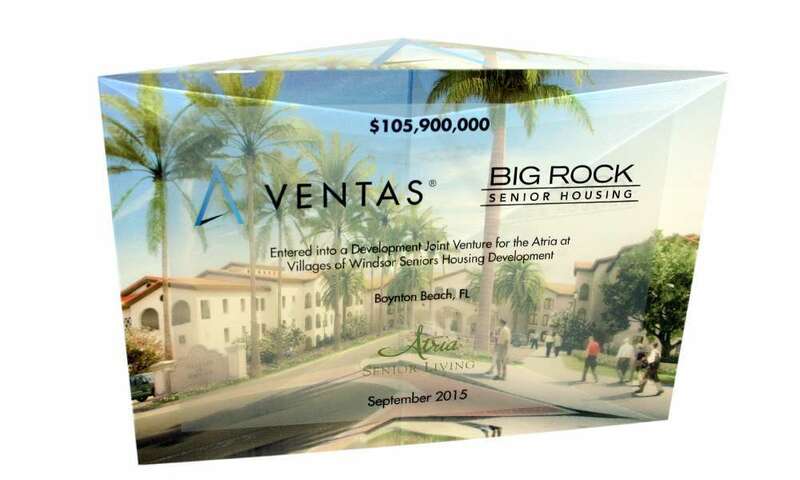 The joint venture is focused on four senior housing properties. 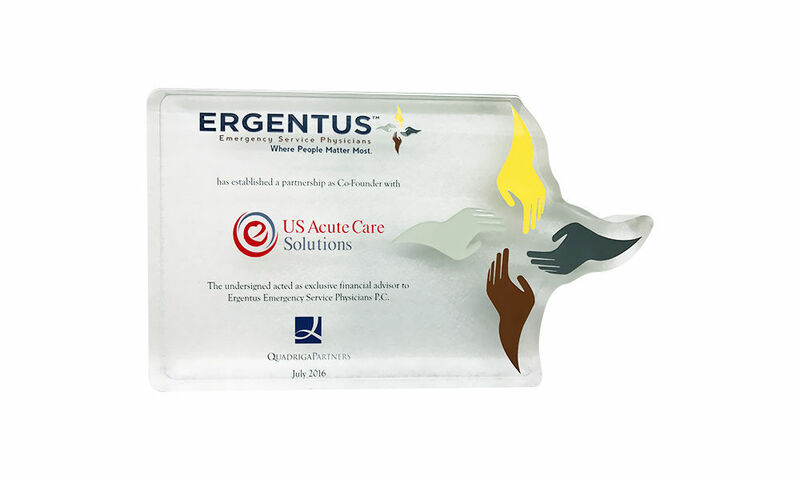 Custom acrylic award honoring the research, development, and commercialization agreement between Sanofi and Regenereon. 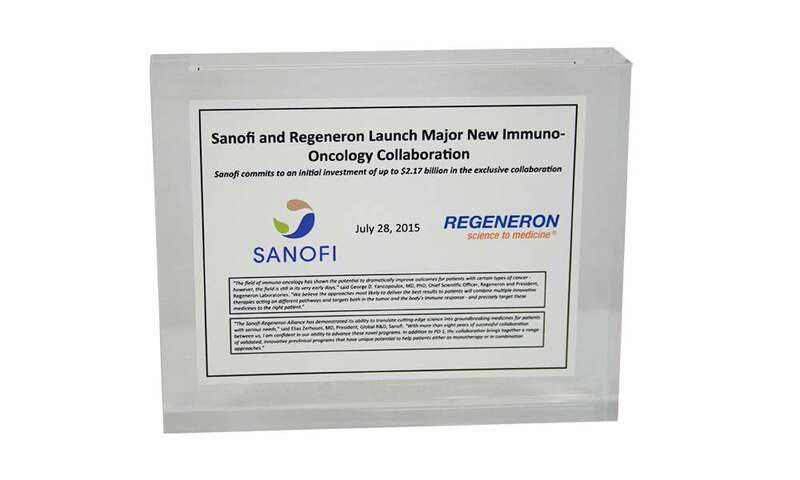 The agreement will center on antibody cancer treatment in the field of immuno-oncology. 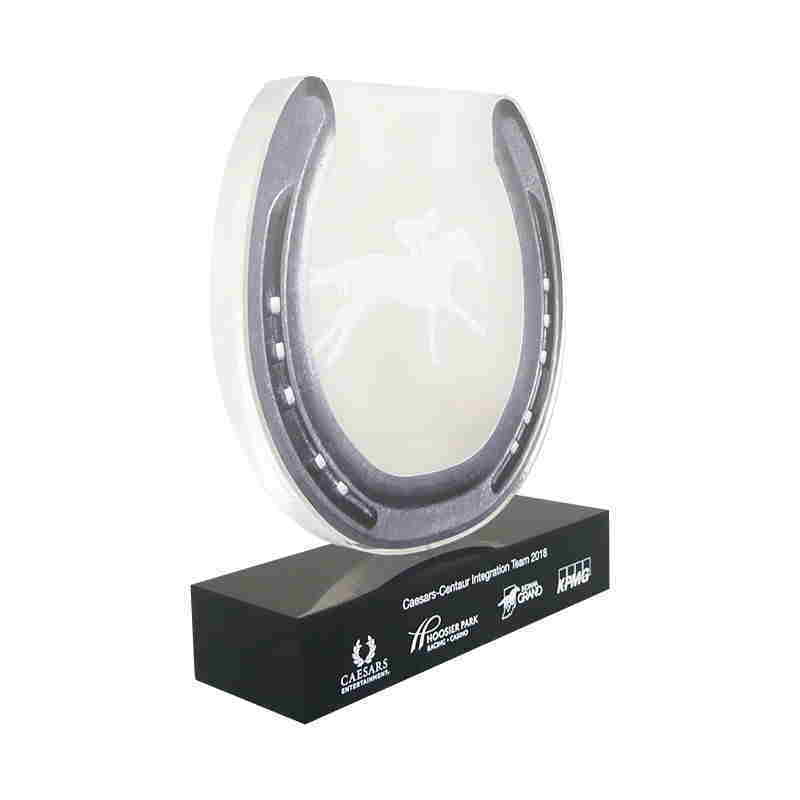 Custom Lucite celebrating a joint venture between InterContinental Hotels Group and Noble Investment. 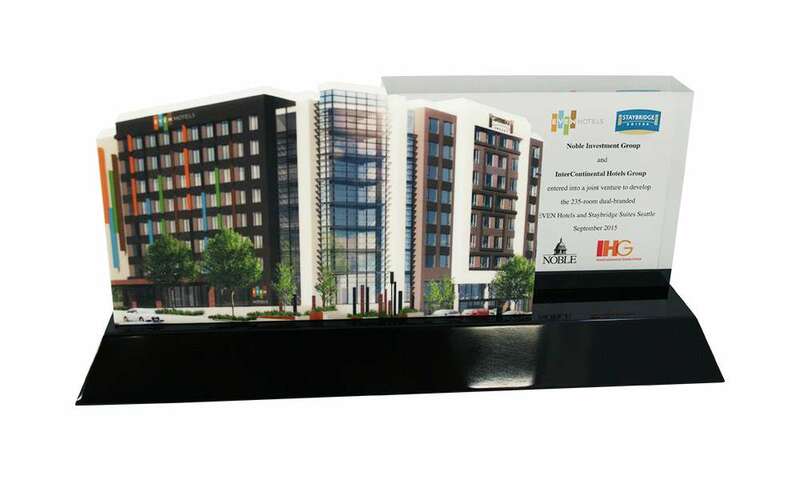 The partnership centers on the construction of of a dual-branded hotel in downtown Seattle. 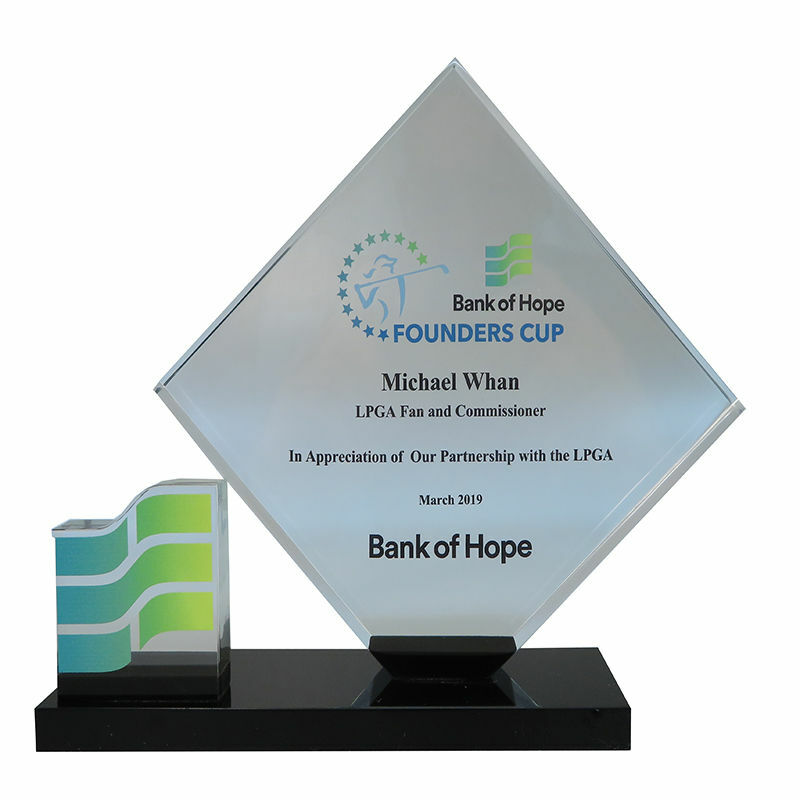 Custom acrylic award recognizing a real estate joint venture involving Ventas and Big Rock Partners. 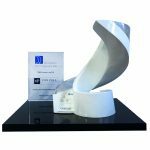 The collaboration centers on the development of a senior living community in southern Palm Beach County, Florida. 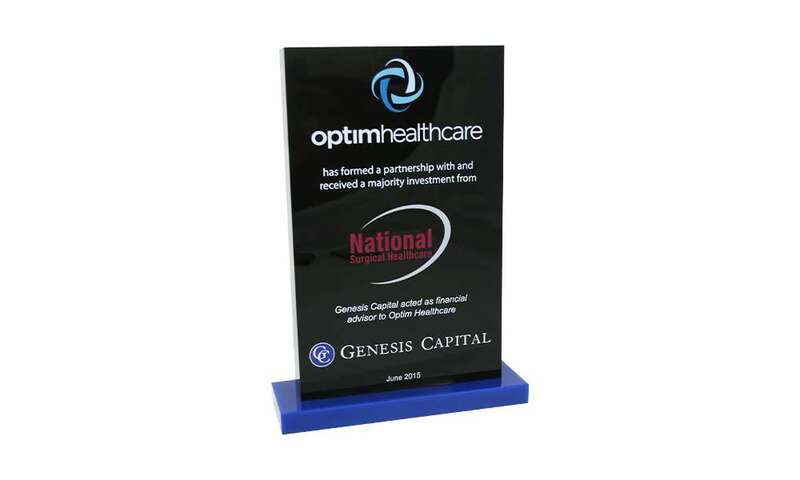 Custom Lucite commemorating partnership between Optimhealthcare and National Surgical Healthcare. 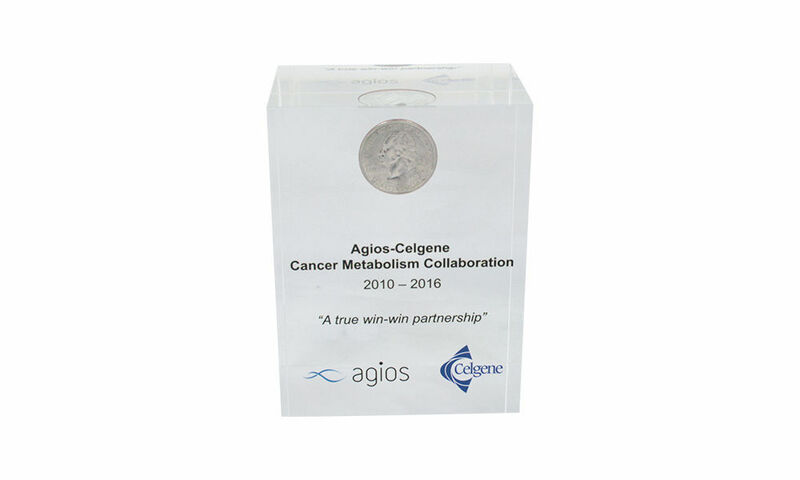 Custom acrylic award marking the cancer research collaboration between biotech firms Agios Pharmaceuticals and Celgene. 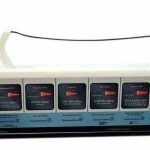 The research focuses on cancer metabolism. 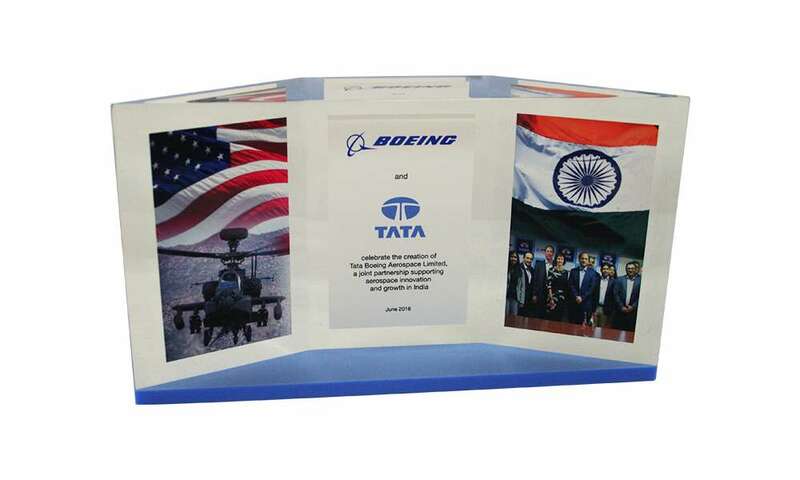 Custom Lucite trapezoid marking a joint venture agreement between Boeing and Tata Advanced Systems. 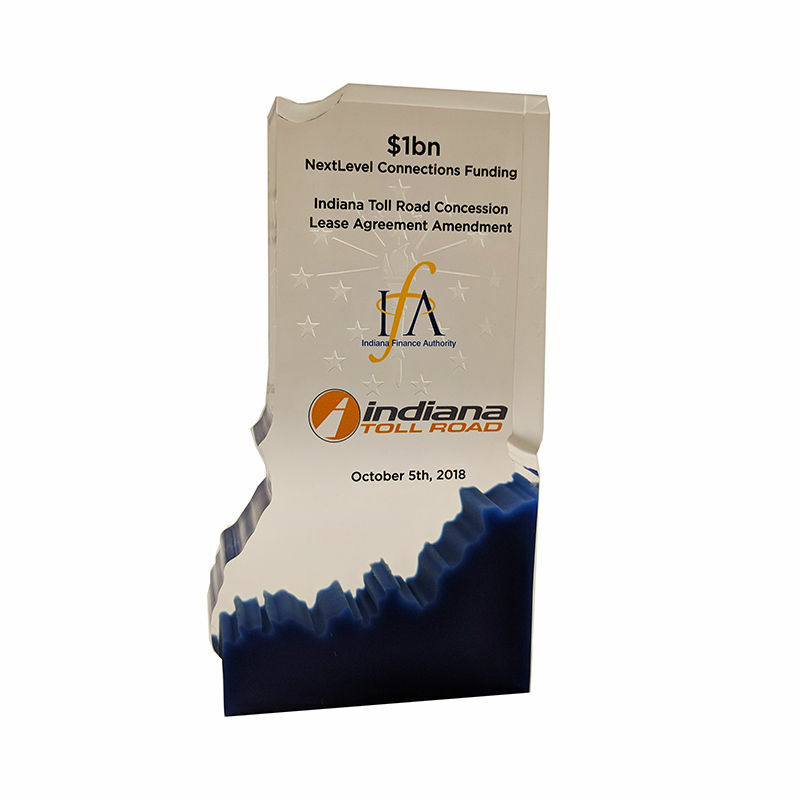 The agreement focused on the production of Apache helicopters in a new facility in India. 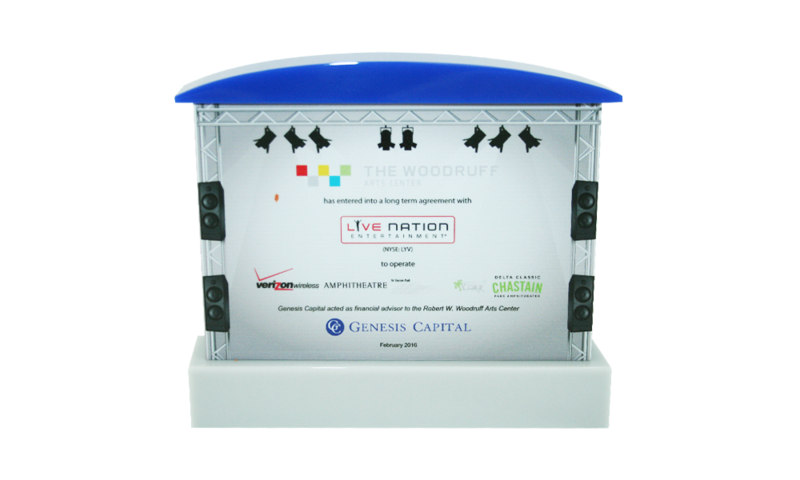 Stage-themed custom acrylic commemorating a long-term agreement between the Georgia-based Woodruff Arts Center and Live Nation Entertainment. 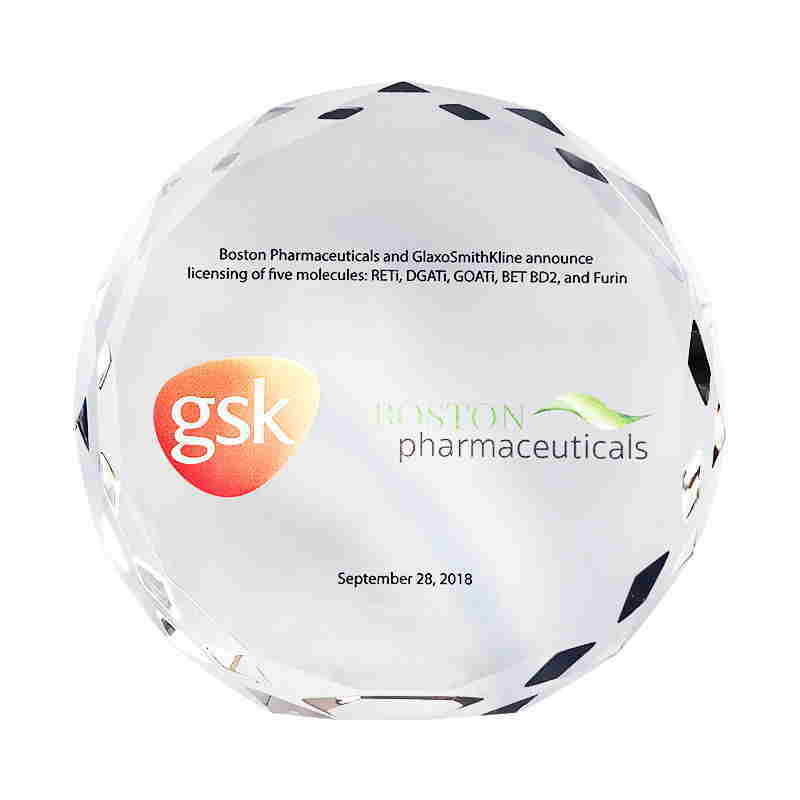 Custom crystal commemorating a license agreement between biotech firms Dermira and Genentech, a division of pharmaceutical company Roche. 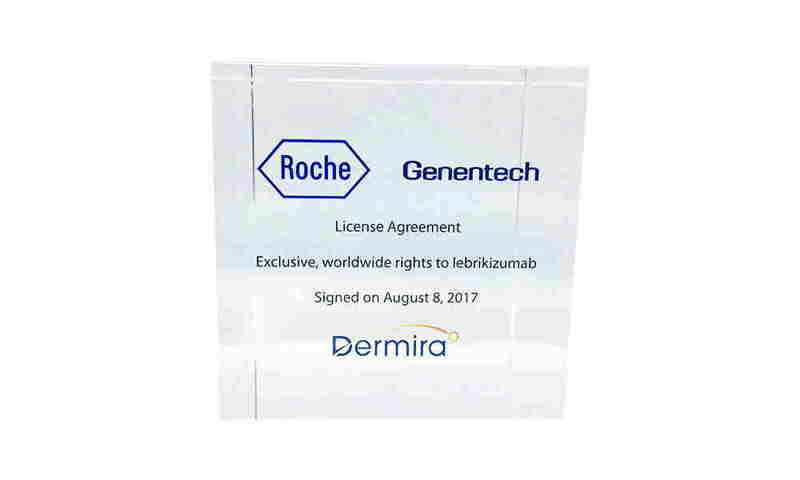 The agreement involves the worldwide rights to Lebrikizumab, developed for the treatment of lung diseases such as pulmonary fibrosis. 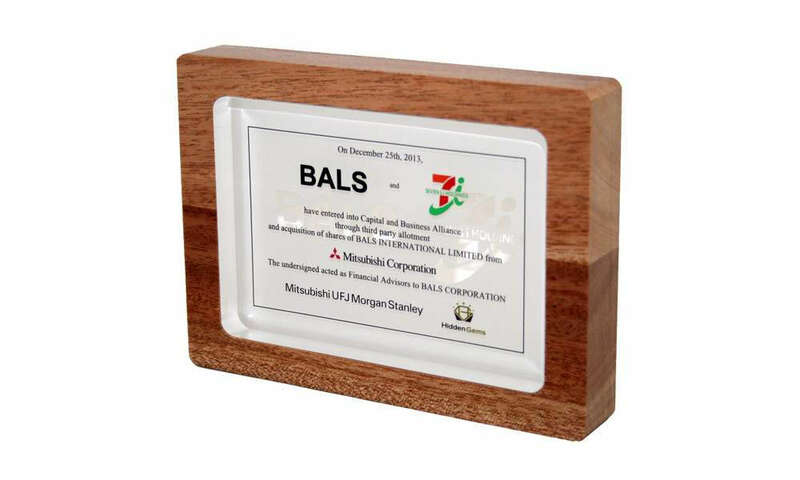 Lucite and wood custom commemorative marking a capital and business alliance involving Bals International and Seven & i Holdings, both based in Tokyo. 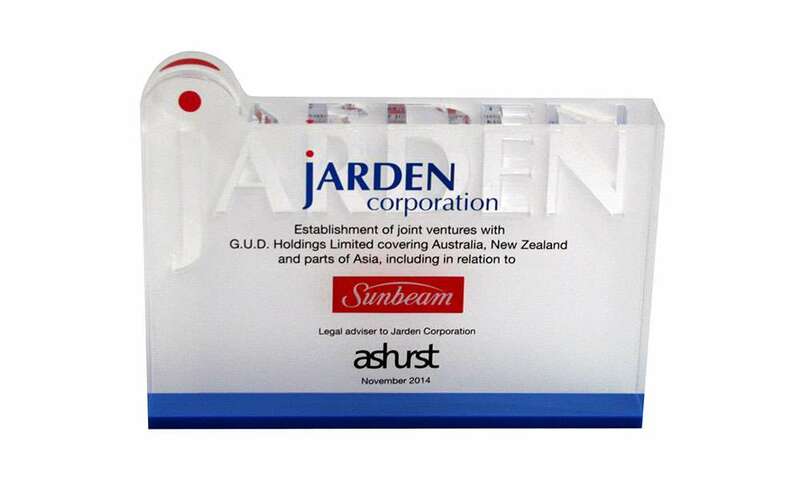 Custom Lucite commemorating a joint venture between Sunbeam and Jarden. 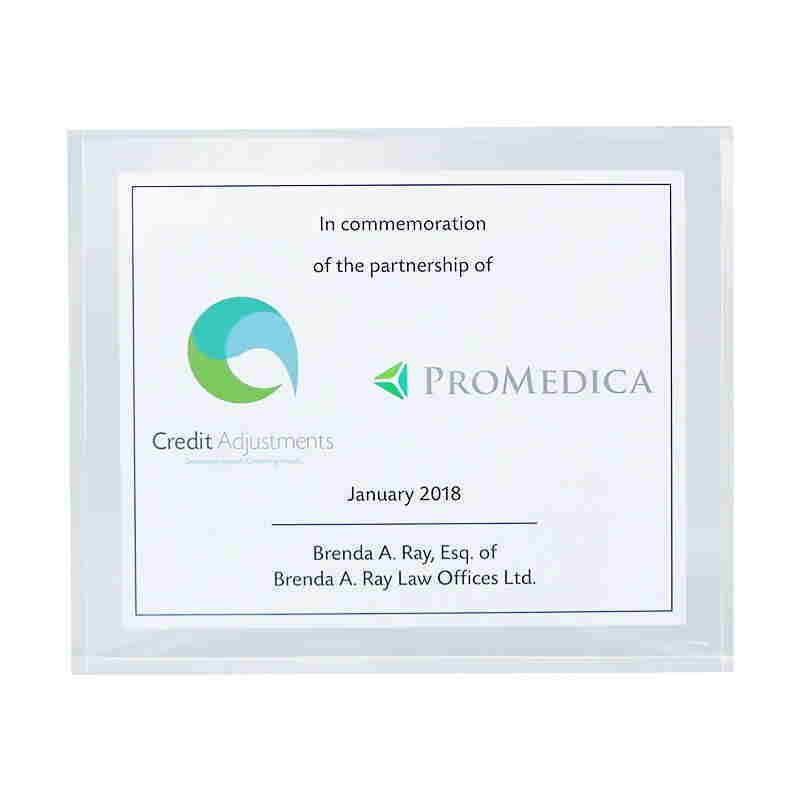 Custom acrylic commemorative honoring the partnership between Promerica and Credit Adjustments. 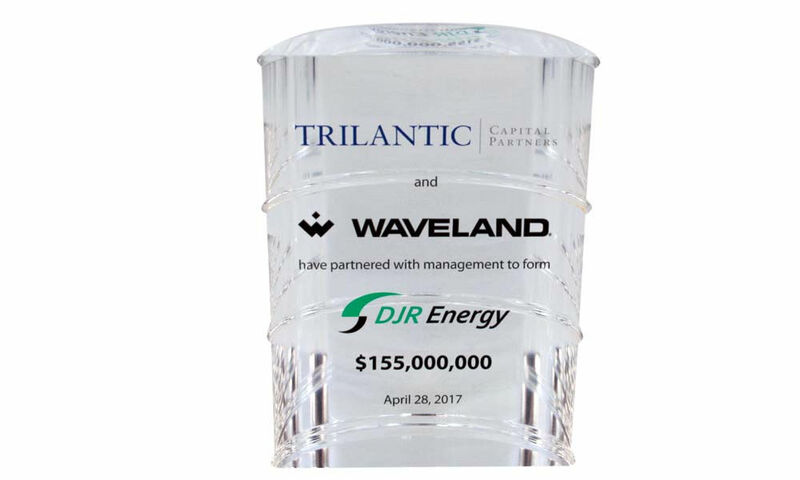 Crystal oil barrel award recognizing a joint equity investment in oil and gas exploration and production company. 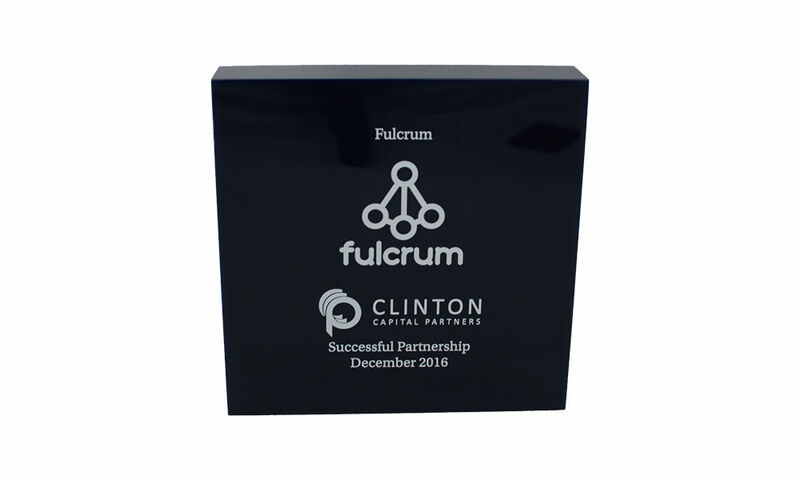 Custom acrylic marking a partnership between data analytics firm Fulcrum and Clinton Capital Partners. 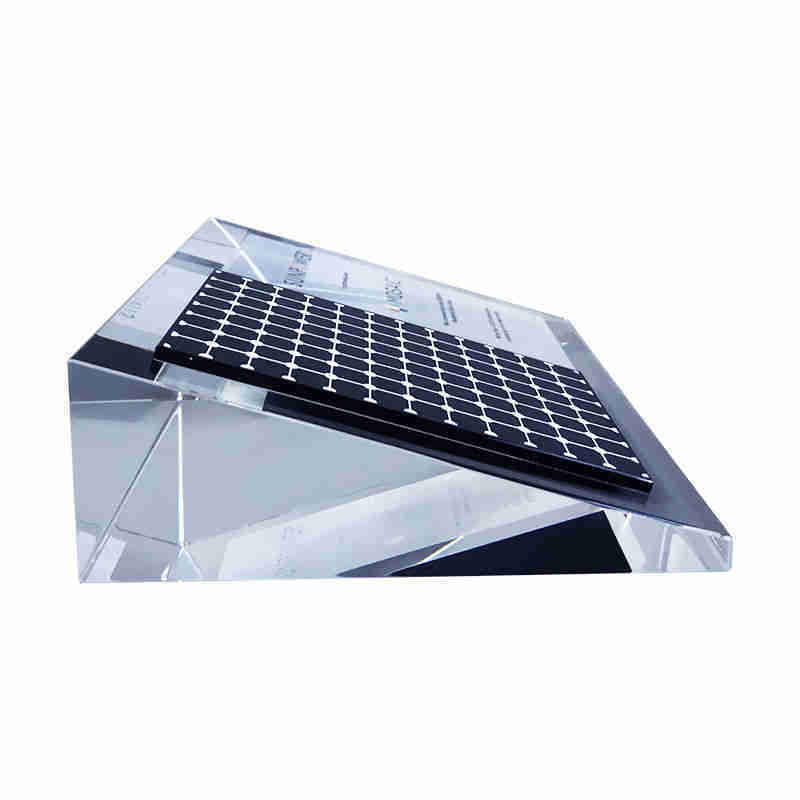 Formerly based in New Zealand, Fulcrum is now based in Sydney, Australia. 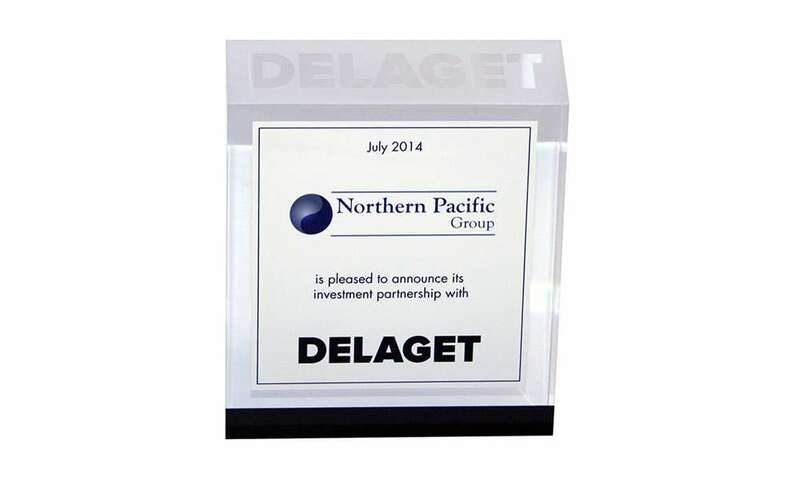 Custom Lucite for Delaget-Northern Pacific partnership. 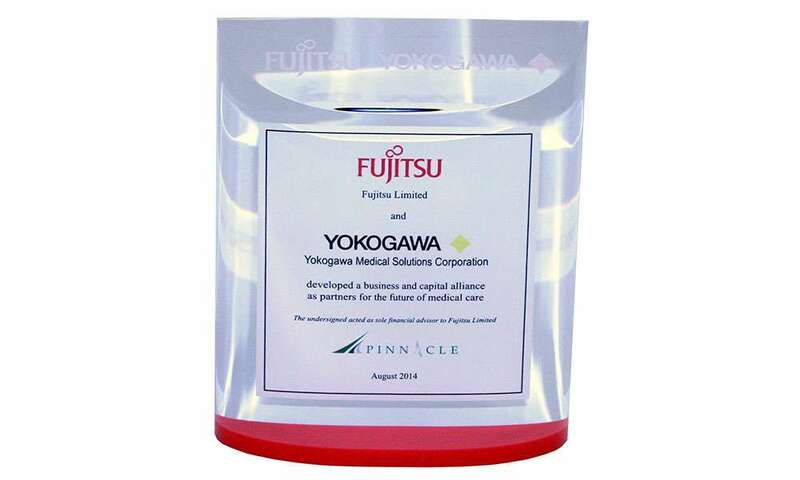 Custom Lucite commemorating a joint venture between Fujitsu and Yokogawa Medical Solutions. 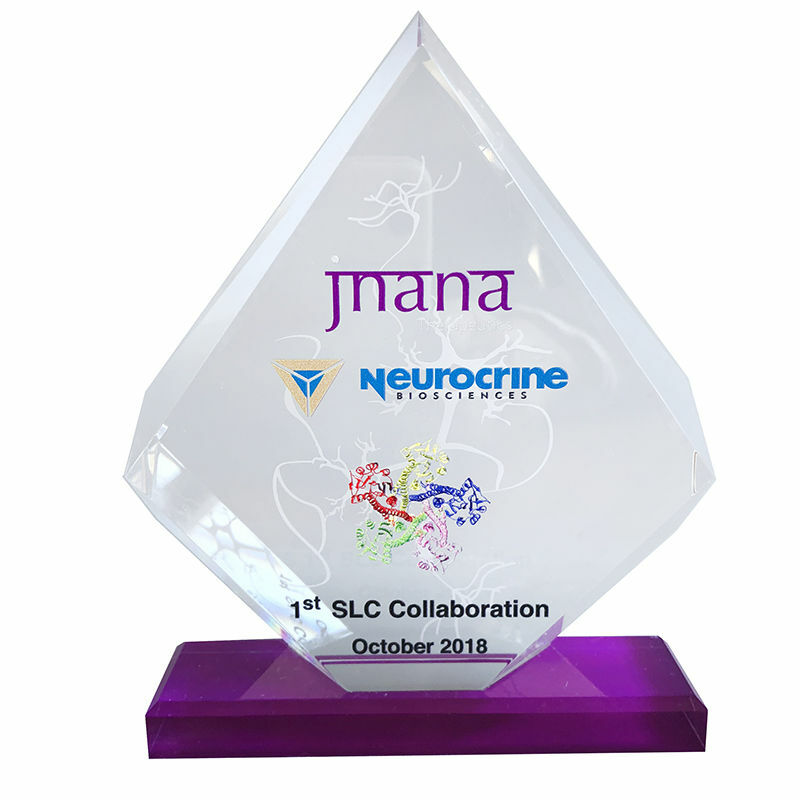 The partnership will focus resources on the future of medical care.